James Rountree came 10th and 13th in his divisions at the Australian Junior Championships. 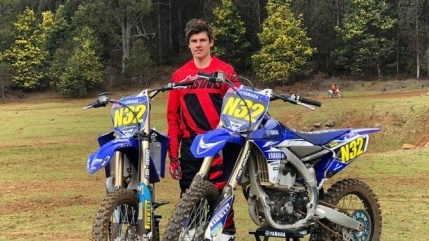 Whanganui High School's James Rountree exceeded his expectations after a strong finish at the Australian Junior Motocross Championships on Saturday. The now-16 year old competed over six days in two 15-year divisions of the championships, held in the small Tasmania town of Penguin. Rountee came 10th in the 250cc 4 stroke class on his Yamaha YZF250, coming just behind the official Australian factory-backed riders and only three points off eighth overall. Five races counted for each division. In the 125cc class, Rountree took his Yamaha to 13th overall, coming five points off another Top 10. "In the third race on his 125cc he managed a sixth place finish," said father Antony Rountree. "Getting good starts was the key – riders from fifth to 20th place were only separated by one second a lap. "The finals were held over five 12-minute races on a clay based track. The track got very rutty and fitness and technique played a big part." Helping Rountree get to Tasmania was his supporters in Bike Torque Taumaranui, Balance Chartered Accountants, Harvey Round Motors, Mitre 10 Future Champions Trust, BNT, Alpine Star and Yamaha NZ.